I am writing with a big announcement. 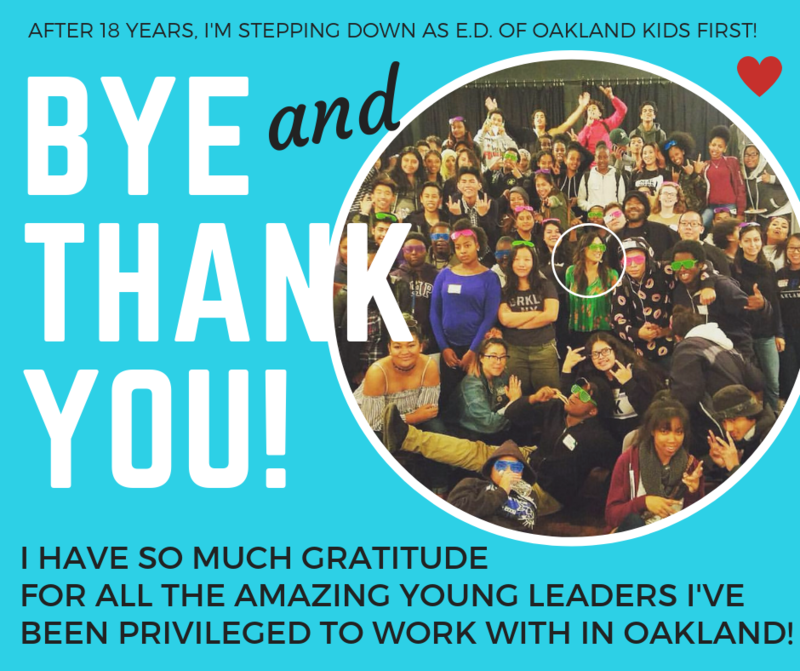 After 18 years of working alongside hundreds of powerful youth leaders, an incredible staff and board, the most committed school site, district, and community partners – and collectively winning countless victories, big and small, to improve high schools across the city for our highest need students – it’s time for me to step down as Executive Director of Oakland Kids First and move on to become the first staff person of the J4OS (Justice for Oakland Students) coalition! In a nonprofit field where turn-over is frequent, people have often asked me why I stayed so long. I’m not going to lie – there were days at work when the sheer magnitude of what we’re up against, made me feel like I’m not doing enough. And yet the power, hope and possibility that each new generation of young people brings to the work, has inspired me and our organization to forge ahead, with an even bigger vision from one year to the next. And I cannot believe how blessed I am that this has been my job for almost two decades. My deepest thanks to the young people and adult allies who fought for and won: free bus passes for 30,000 youth in Alameda county; the renewal and expansion of the $72M children’s fund; a peer academic mentoring program for 2,000 freshmen annually and an A-G credited Leadership class in OUSD that all improved college access; Codes of Respect that improved school culture and lowered suspension rates; and other victories that have fundamentally changed what schools look and feel like. Thank you to the O.G. Kids First Coalition who passed Measure K establishing the children’s fund in 1996 and who kicked this whole thing off (hiring me in 2000). You taught me: we are better and stronger together. I’ve tried to carry that throughout. Thank you to the many OKF staff over the years who created the spaces necessary for youth to grow into their leadership, run campaigns, and most importantly – feel safe and loved. Your superpowers and contributions shaped who we are today. Thank you to the OKF Board members. We were small but mighty – and I am grateful for your support, guidance, oversight, and commitment to Oakland youth. You helped me hold the organization emotionally, and for that I am so grateful. Thank you to the long-time funders who believe in us and go to bat for us year after year, and who make sure we have the resources to center youth voice and leadership in the fight for Oakland schools. Special thanks to Lukas Brekke-Miesner, a third generation Oaklander, who has spent almost a decade with me at OKF and will be moving into the ED role. He was ten when Measure K passed and spent his weekends door-knocking to make that happen. He attended Oakland public schools and has dedicated his life to serving the most marginalized youth populations. For those that know him – he is the heart and glue of this place, that kept us all together when the funding for youth organizing fell out and when it wasn’t clear where we were going next. He kept us believing we could stay resourced and relevant by focusing on two core things: providing solid youth development programs and by evolving our youth organizing model to adapt to the times. And he was right. I feel confident that Lukas and the powerful team we have assembled here at OKF will take the organization to the next level and do even more amazing work with young people. In the coming years, we will continue to face critical choices about whose city this is, who our schools serve, what we value as a people, and what kind of communities we are building. Oakland is in a moment in time where the forces that support charters and disinvestment in our schools are the same forces that support unchecked development and oppose affordable housing. OKF has always fought this battle of values in the best way we know how–by engaging deeply with young people most impacted and working with them to analyze, speak out, and organize their peers. Over the years, we have developed hundreds of trainings and popular education sessions to help students understand the forces at play, and to build with each other to create and move their vision for their Oakland. I plan to take this theory of change into my next iteration. Through this work with young people, the schools and the district, and in my role as a parent of two kids who attend schools in the district, I realize that no one group will single-handedly bring about justice in OUSD. It will take partnership, coalition building, and an intersectional approach to tip the scales against the monied-interests currently calling the shots in our district and city. This is why OKF initiated the student and family centered J4OS Justice for Oakland Student Coalition with partner organizations in 2016. On September 17, 2018 – I will become the first staff person of the J4OS coalition in service of young people and equity in OUSD. It feels like I’m coming around full circle. I was the first staff person hired for Oakland Kids First when it was still a coalition back in 2000. I plan to make this next J4OS coalition just as proud as I hope I made the first one. I am excited by what this next chapter holds for me. There are exciting times ahead. We’re going to need everybody on board. As we continue to: make sure that the $60M in additional cuts to OUSD are made in Central Office and kept away from our schools and kids; make sure that after Prop 13 is repealed by the voters in the coming years for commercial properties, the new monies that come back to rebuild our school system will prioritize the vision and needs of the students who have been most harmed and neglected over the past decades; and that our schools are powerfully and equitably led by the wisdom of our students, families and educators. Finally, I would like to close by expressing my gratitude to the mentors who contributed to my development; to my family and friends for their unconditional love; and to the youth who have fought for deep, transformative change in Oakland. You are the reason Oakland Kids First ever came to be and will be the reason it continues onward! 2) Donate to Oakland Kids First so they can continue supporting youth organizing in Oakland! 3) Join me at Somar from 5 -7:30pm on Friday, September 14th to celebrate my 18 years with OKF!